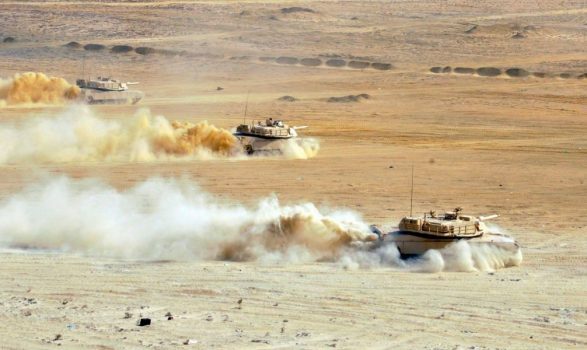 Egyptian tanks participate in Arab Shield military exercises in November 2018 (photo via the Egyptian military spokesman's Facebook page). On February 9 last year, the Egyptian military spokesman announced the launch of “Comprehensive Military Operation Sinai 2018.” The operation, which involved the army, navy, air force, border patrol, and police forces, began after a speech in late December 2017, after a deadly attack on a mosque in Rawda, North Sinai. In his speech, Egyptian President Abdel-Fattah El Sisi demanded that terrorism be defeated in Egypt within three months. Security forces were extensively deployed not only in the restive Sinai Peninsula, but also to the Western Desert and parts of the Nile Delta. The massive offensive—which launched weeks before the presidential election—was marketed by the Egyptian media as all-out war and final odyssey to crush Wilayat Sinai (the Islamic State’s- “Sinai Province”) and clean Egypt’s territory of terrorism. Despite this intense escalation of Egypt’s military operations in Sinai—an offensive associated with acute humanitarian crisis, and during which the Egyptian army listed massive successes—Wilayat Sinai still, a year later, enjoys high tactical and operational capacity and continues to pose a serious threat to the whole country. In its own propaganda around the campaign, the Egyptian army both downplayed the scale and significance of Wilayat Sinai attacks and amplified the security forces’ achievements. In more than 30 communiques over the course of the campaign, the army spokesman claimed the Egyptian army had killed 464 alleged terrorists and arrested 7,491 individuals. Taking into account the estimated number of Wilayat Sinai fighters (1,250 at the highest estimates, per the Combating Terrorism Center at the U.S. Military Academy), these figures cast doubts on the accuracy of the military statements. This lack of credibility also applies to the security forces, who are accused of engaging in extrajudicial killing to make up operational successes against the terrorists. In a January 2019 incident, the bodies of two alleged terrorists were acknowledged by their families. The families claimed that the two men were prisoners subjected to forced disappearance by the security forces following the completion of their jail terms. Doubt about the accuracy of army statements does not rule out the operation’s successes. It has, to some degree, restricted the militants’ movements, destroyed a number of hideouts, and most importantly eliminated several trained and influential elements such as the Emir of Wilayat Sinai, Abu Osama al-Masry, whose death the group acknowledged. The problem, however, is that these successes have not had a sustained effect on Wilayat Sinai activity, which has proved its resilience despite these losses. Besides concerns around reporting, the siege-alike security measures and home demolitions carried out as part of Sinai 2018 led to an acute humanitarian crisis. Severe restrictions on people’s movement and food supplies left 420,000 residents in urgent need of humanitarian aid. People in all northern Sinai zones were denied essential items including medicine and cooking gas, in addition to a complete ban on selling or using gasoline for cars. Sinai residents had to queue to queue to obtain food from an army distribution point. As part of the comprehensive operation, the Egyptian army also intensified home demolition operations to implement buffer zones along the borders with Gaza in Rafah and around Arish International Airport. These operations have left thousands of families as internally displaced people. According to Human Rights Watch, the Egyptian army home demolition operations during the comprehensive operation went beyond the designated buffer zones in Rafah and Arish, including “hundreds of hectares of farmland and at least 3,000 homes and commercial buildings.” The army and security forces have also destroyed several homes in Arish as a retaliatory action against political dissents, wanted terrorists, and suspects. One example is the home of Hussam al-Sharbaji, a presenter at Mekameleen television channel in Arish which was reportedly set on fire in September 2018. TIMEP data covering Wilayat Sinai operations reveals that the group maintained a high frequency of attacks throughout the duration of the campaign. This data shows 204 incidents, a monthly average of 18 attacks, despite a temporary slowdown in the middle of the operation during a high tempo of military operations and the extremely tight security measures imposed in the peninsula. These occurred across all the main zones of North Sinai (Arish (83), Sheikh Zuwied (46), and Rafah (67), in addition to a number of major attacks in multiple regions of Central Sinai (8)). These attacks were conducted using multiple arms and tactics against both opportunistic and predetermined targets. Throughout the operation, Wilayat Sinai persistently engaged in complex attacks, assassinations, ambushes, kidnapping, sniper attacks, and explosions. Excluding kidnapping, all these types of attacks were frequently documented in every month during the operation. Wilayat Sinai also carried out complex coordinated attacks using multiple tactics and several types of weapons, usually resulting in severe army causalities. Just a few days after start of the operation and while the security alert was at its peak, four Wilayat Sinai militants targeted the headquarters of Battalion 101 in Arish. They reportedly clashed with the army forces stationed there, using small arms to reach the center of the building before detonating their suicide vests. The same modus operandi was used when 14 members of Wilayat Sinai attacked the Qasima Barracks in the al-Hasna region of Central Sinai on April 14, 2018. Although Qasima Barracks is one of the most secure army points in Sinai, the militants managed to breach its fences. While the Egyptian army spokesman downplayed the scale of the incident by announcing the martyrdom of eight soldiers and the injury of another 15, local media covered the funerals of at least 20 army members. The Islamic State’s Amaq Media Agency said that this attack killed 22 army members, including seven officers. Other complex attacks followed, and, as recently as December 16, a group of Wilayat Sinai attacked a Border Guard unit with medium and heavy weapons and IEDs, leaving 20 army personnel reported killed or wounded. These attacks were reported at different times throughout the operation and were geographically distributed across Sinai, including both remote and urban areas. The attacks highlight Wilayat Sinai’s persistent capacity to conduct sophisticated, complex operations against major army targets, and indicate that the presence of army units and the application of tight security measures have largely been unsuccessful at restricting the militants’ movement and capabilities. Wilayat Sinai has long been capable of targeting predetermined individuals known for being army or police affiliated or tribesmen collaborating with the security apparatus. This type of attack seemed to continue throughout the offensive, as Wilayat Sinai claimed responsibility for multiple targeted assassinations, based at times on intelligence on targets’ movements and locations. One example was the attempt to assassinate the head of Central Security Forces in Arish, Major General Nasser al-Husseini, by targeting his convoy using an improvised explosive device on May 18 in south Arish. Shortly after the incident, which wounded Husseini but killed his chief aide, Wilayat Sinai claimed responsibility for the attack and stressed the significant profile of the target in its statement. Husseini had survived an earlier assassination attempt by Wilayat Sinai in November 2017. Amid the intense escalation of the comprehensive military operation, Wilayat Sinai continued its practice of establishing intermittent checkpoints, searching passengers’ and drivers’ identification to hunt opportunistic targets like army soldiers and tribesmen collaborating with the army. The site of most of these checkpoints has been the international road west of Arish, which leads to mainland Egypt, and Wilayat Sinai also carried out out ambushes in the same sites on this road, mainly in an area called Sabika located between the villages of Maydan and Rawda. TIMEP data shows that Wilayat Sinai has repeatedly executed or kidnapped army- and police-affiliated individuals after establishing checkpoints in this area. In one example on June 14, about 12 militants set up a checkpoint in Sabika and executed three soldiers who had been traveling in a civilian car. This incident was filmed and exploited by the Islamic State propaganda machine. On December 18, Wilayat Sinai kidnapped a Christian police forensic expert after establishing a checkpoint in the same location. This operation was proudly claimed in the Islamic State’s weekly electronic publication, al-Naba. The Egyptian army has recently intensified the use of airstrikes in Sinai as the government sought major successes before declaring an end to Operation Sinai 2018. Like previous escalations, these airstrikes will not make a major difference if they are not a part of a comprehensive strategy. This strategy should account for the root causes of terrorism and insurgency, as opposed to the current tactics conducted at the expense of hundreds of thousands of residents. The counter-terror campaign must be based on accurate intelligence that leads to precise targets, rather than a heavy-handed war that may drive the civilians toward the militants. Successes such as the elimination of senior commanders and trained fighters would severely degrade the group if Wilayat Sinai were prevented from recruiting and training new fighters and replacing commanders. This will not be achieved under the current military approach in which the causes of insurgency are ignored. On January 22, 2019, the Egyptian military spokesman released a new communique detailing its progress on the war on terrorism. Unlike previous statements, the name of the Comprehensive Operation Sinai 2018 was avoided, tacitly conceding that the operation has ended. While the military was right to avoid a premature declaration of victory, the statement indicates that combat operations will continue in Sinai much as they have over the past several years, with little change coming as a result of the past year. Continuing the same strategy will likely achieve the same results: an image of victory without real, lasting success.